iPad has become a great music tool which I use daily for practicing, performing and teaching. It is especially a great mobile solution for your music – audio and video playback and streaming, scanning, recording audio, and video, pitch and speed control for music transcription, a midi controller for virtual instruments, drum loops, music notation, taking notes and more. iPad is a very handful tool for storing and reading music scores. It can save you a huge amount of space (and weight in your bag:) by going completely paperless. 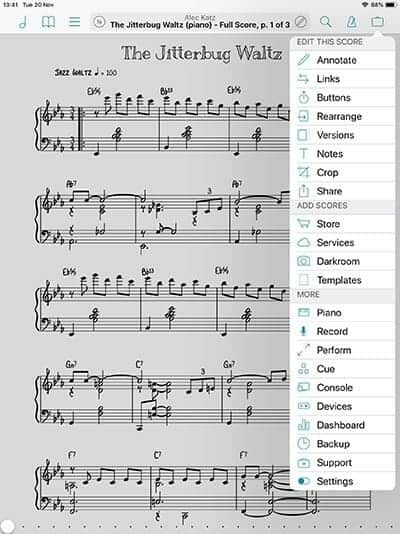 Just scan your music or load your sheet music into it. There several apps for it, like forScore, unrealBook, iGigBook, Deep Dish GigBook and others but the best to my opinion is probably forScore. I’ve been using the forScore app since I’ve bought my iPad Pro 10.5 in 2017. It is a really powerful app. 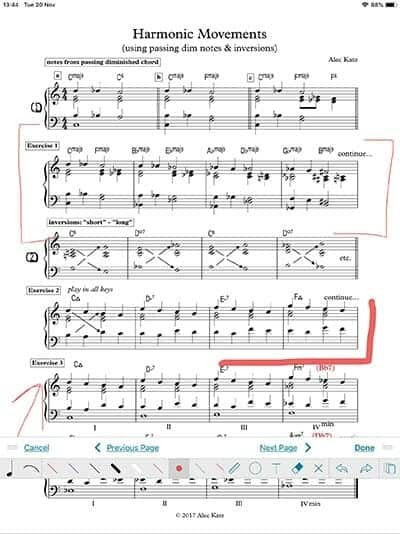 Besides storing and opening PDF files with sheet music it does annotation, sharing, scanning, syncing with audio files creating bookmarks, organizing and reordering music, setlists and more. All of this works fast in a beautiful elegant interface. forScore is been great not only for single scores and parts. You can also load Real Books and Fake Books that have hundreds of songs in one giant file. forScore version 10 adds a great feature that allows you to add indexes to large scores by uploading a CSV file that links the song titles to specific page numbers of the PDF. You can now search for a specific song and open it in seconds within a huge book. I have found the list of downloadable index files for apps like forScore and unrealBook here. Just download the CSV file and open it in forScore to sync with a corresponding book. 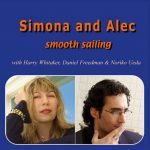 Your Real Book will become indexed with a table of contents corresponding to songs. You can search and share the specific song within the app. I could not find the Real Book 6th edition index file anywhere on the internet. So I have created an index CSV file for Real Book 6th edition which has an exact match to its pages. 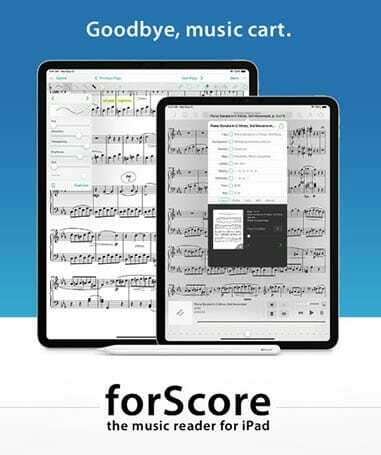 Here is a nice article on iPad score reader apps from scoringnotes.com (NYC Music Services), a post from January 10, 2019, by David MacDonald. The Real Book 1 in Eb doesn’t sync up? Any suggestions ? You should check if your version of RB is identical to Real Book 1 (concert key). Open Real Book 1.csv on your iPad in forScore (find it here: http://diystompboxes.com/unrealbook/csvindexes/ ) and assign the bookmark of the first tune to the related page. If your PDF has missing pages adjust the bookmark manually using the method described in the YouTube video above. Hope it will work. What is your experience with iGigBook? It seems to have many indexes built into the app and built specifically to handle real books and fake books. I would think it would be a lot less trouble than trying to track down CSV files and proofing them. Many indexes built into the app is the main advantage of iGigBook. This is much useful if you have a great collection of Real and Fake books on your iPad. The app’s cons are the outdated user interface, the annotation is a limited and inconvenient. It lacks the options that other similar apps offer, like bookmarking, sharing, scanning pages playing audio inside the app. Thank you, Phil. I’ve been using your app for quite a while and find it very usefull for quick song searches and references while working with students. Looking forward to version 6. Thanks for the index file for 6th Edition! I’ve been unable to find it anywhere else!